Finally, “the call” comes and we are shell-shocked. Someone likes us! Someone finally likes us! Rather, an editor at a publishing house likes out voice, our novel, our baby. We are at the top of the world. Published author! It sounds so magical and is. We break out the champagne and the chocolate. Our book is published. We can announce to the world that we are a published author. The worst is over. The worst is not over. The real work is just beginning. Writing and publishing the novel are only a part of the battle. I’d say that 10% is writing the novel and 90% is marketing it. Friends often find it surprising that I did not major in English, journalism or creative writing and yet I am a writer. I have a BSBA in Marketing and, actually, it has proven to be the best education for my writing career. Being a writer is a business. There’s an adage about “starving artists.” Yes, they are starving because they do not put as much effort into marketing their work as they do in creating it. Sales, marketing and public relations skills are necessary to succeed in every creative field. In writing, it is of utmost importance. Your product is your novel and it is your job to get it out into the marketplace, the reader’s hands. I probably spend more time marketing my published work than writing new material. In the modern world of “social media” and the competitiveness in the publishing field, one has to be on top of the game. There are so many outlets for promoting novels and all of them take time and constancy. In this technology-based world, a writer has to have a Facebook presence and must maintain it through regular posts and interaction with fellow writers and readers. Groups must be a part of Facebook as well as “Like” pages. There is Linkedin to connect with fellow business professionals, also readers. Don’t forget Twitter for those short bursts of promotional and informational data. Gaining followers is necessary. I have Pinterest boards for all of my interests, published novels and unpublished novels. Yes, people do re-pin and thus see your boards. Another way to get your name in front of the public is through Goodreads, where writers meet readers. After all, writers are readers, too. Fellow authors are readers and exchanging novels for book reviews helps increase visibility. There are blogs to guest on and a personal blog to maintain. There are book reviewers and review sites. And, don’t forget the importance of having and maintaining a professional website with links to all of the above. On top of all of this, one must frequently visit Amazon, Barnes and Noble, I-Tunes and other vendors to see how books are being marketed and being sold. Most important, it’s the personal selling to friends, acquaintances and even strangers. This involves, post cards to hand out and books to lend out and even give away. In addition, press releases need to be written and distributed. Getting free exposure in the local media gets your name out. Advertising? Some authors pay to run advertisements to promote their books and their names. Some even secure celebrity endorsements, the ultimate sales tool. My brain is constantly on overdrive trying to create the next marketing push. Tired yet? You can now see that there’s more to just writing the book. Your publishing house, editor and agent do not have the time or inclination to market authors. If you are published by a small publisher or a large conglomerate, the marketing of you and your books is up to you. You hold the key to your success. If the ideal marketing plan could be bottled, I’d be a billionaire! 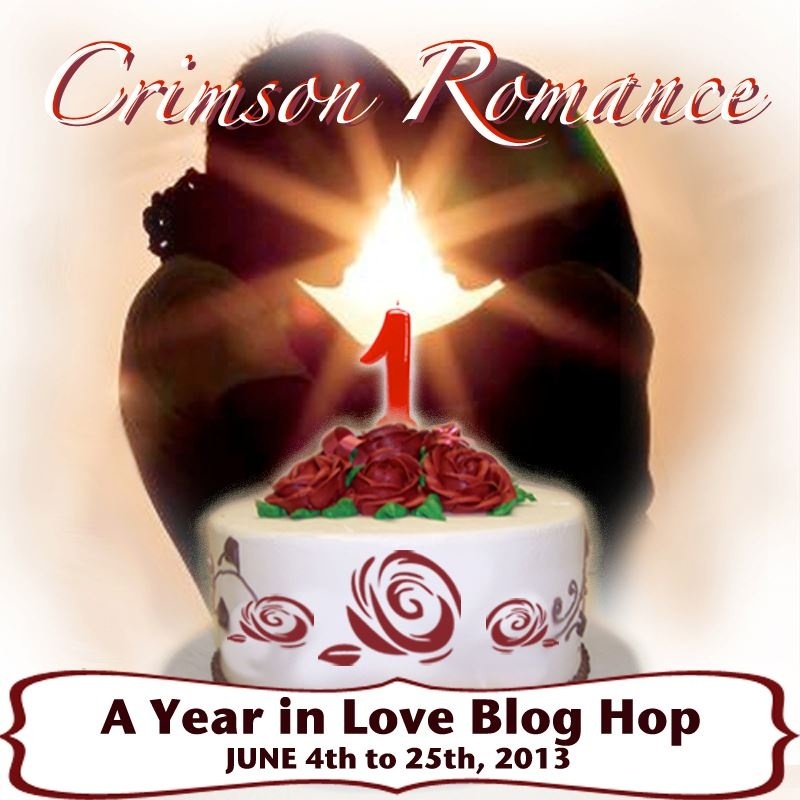 I am celebrating the one-year anniversary as a debut author with Crimson Romance. “Lab Test” was my first Crimson novel and in May, my fourth, “The Right Combination” was released. Time flies when you’re having fun. For three weeks in June, the Crimson Romance Sisters are hosting a blog hop, where we will be offering a chance to win one of two $50 gift cards (one for Amazon and one for Barnes & Noble) to all those who visit our blogs. There are also going to be individual book giveaways from many of the participants, so be sure to check out everyone on the hop list, because there are prizes aplenty! As well as the prizes, the participants are posting excerpts from their books to tempt you. And as if that wasn’t enough, there is an exclusive brand new short story being posted, written by seven Crimson Romance authors. Everyone is synchronising their posts, so all excerpts and story chapters will be available immediately, meaning you can spend all day happily clicking lots of lovely links and reading to your heart’s content! Please stop by and share in the fun! Safes are as mysterious and alluring as a woman. Strong yet gentle to the touch. Rafe sought quiet and refuge from his father and Emilio. He walked through the side yard, brushing past scented geranium and hibiscus, ducking under a lemon tree and into the postage-stamp sized backyard. The air was muggy humid with the sweet aroma of his mother’s herb garden of cilantro, dill, oregano, basil. Salsa music drifted from a neighbor’s open window. A full moon glowed in the clear sky casting a blue light over the palm trees, bushes, and flowers. As he looked up at the moon all he could see was Nalani Hana’s oval face, her almond eyes framed by wispy lashes, her high cheekbones, and lush full lips. He could almost smell her floral perfume and feel her honeyed skin. Wasn’t it bad enough that his family was plotting a relationship? None of it was making sense. Nalani was a suspect, an accomplice, or somehow related to a serious string of murders. The trip to Miami was to investigate her not fall for her. Her silken voice cut into his thoughts. Rafe turned to find Nalani standing only a few feet away. She was awash in moonlight, hair glittering, complexion aglow, like an angel sent down from the heavens. He stood in place, his heart pounding. “I wasn’t expecting company,” he managed to say. “I escaped my father and Emilio because of their matchmaking,” he admitted. Nalani sashayed toward him, swishing her long skirt with her hands, breasts bouncing beneath her halter top. The night was hot and sultry and so was she. Rafe swiped at beads of perspiration forming on his brow. “What are we to do about this?” she asked, stopping in front of him, hands resting on her narrow hips. Her smile was more electrifying than the moon’s glow. Rafe took a step toward her. Peering down into her mocha eyes, he placed one hand on the small of her bare back, the other grasping her hand. Pulling her against him, he whispered in her ear. “When all else fails, dance.” “Dance?” His breath was hot against her ear, his scent expensive spicy. Firm was his body, all of him, pressed against her. “Hear that music?” he asked. She tilted her head, listening to the strains of guitar, conga, trumpet, and other instruments wafting in the air. Holding her in an intimate embrace, Rafe led her into a slow rhumba. She followed his lead, impressed with his rhythm and timing. He had all the right moves set to music. For a moment she felt like Cinderella at the ball, but her ballroom was a backyard garden, the moon her candlelight, and prince charming Raphael Costillo. “Do you know the name of that song?” Nalani asked. “Besame Mucho.” He drew away to gaze into her eyes. “What does it mean?” she asked, noting the angles and planes of his handsome face,his full lips, and the gold flecks flickering in his dark eyes. “Kiss me a lot,” he answered. “That’s the translation, ‘kiss me a lot.’ Like this.” He lowered his head to brush her lips with his. Soft, moist, trembling. A man could get lost in her lips. He kissed her and kissed her again. Closing her eyes, she looped her arms around his neck, standing on her tiptoes, stretching up and against him. The man knew how to kiss. Electric sparks radiated up and down her spine. As he kissed her upper lip, she parted her lips slightly. His lips parted, tongue caressing her upper and lower lips. Tilting her head back, she welcomed his probing tongue into her mouth. Wet heat filled her as his tongue mingled with hers. As their tongues danced and mated, he grasped her buttocks, pulling her up against his rising, hardening passion. She felt good, too good, as if she belonged connected to him. When she raised her leg and wrapped it around him, pressing him intimately against her, he thought he’d explode. She looped her fingers through his thick wavy hair, drawing his face closer and kisses deeper. Thrusting her tongue into his mouth, he groaned. Nalani opened her eyes as Rafe pulled away, panting. His eyes were glazed over as if in shock when they focused on her. “You’ll have to translate more songs for me, Rafe,” she mumbled, lost in his eyes. He removed his hands from her. She moved her leg and lowered her hands to straighten her skirt. “Blame it on the moonlight,” he whispered, voice quivering. *** Visit an author link below to enter the raffle for some wonderful prizes!!! !